Pope Benedict XVI last week appointed Monsignor Pedro Barreto Jimeno, SJ., Archbishop of Huancayo and First Vice President of the Peruvian Episcopal Conference, as a new member of the Pontifical Council for Justice and Peace of the Vatican. This nomination is added to the responsibility that the Archbishop already performs as President of the Department of Justice and Solidarity of the Latin American Bishop’s Council (CELAM). In addition to Archbishop Pedro Barreto, other members and consultants were appointed to the Pontifical Council for Justice and Peace. These come from various countries, including France, Italy, Germany, Egypt, Austria. Monsignor Pedro Ricardo Barreto Jimeno was born in Lima, Peru on February 12, 1944. He entered the Society of Jesus in 1961. He studied philosophy at the School of the Company in Alcala de Henares, Spain in 1967, and theology at the Pontifical Faculty of Civil and Lima in 1973. 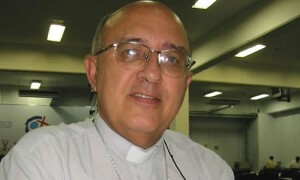 On 21 November 2001 he was elected as Vicar Apostolic Bishop of Jaén. On July 17, 2004, he was appointed Archbishop of Huancayo, a position he currently holds. On the justice side, the Pontifical Council for Justice and Peace is involved in issues relating to social justice, problems specific to the working world, issues of international justice, and problems of development and its social dimension. The Commission also encourages reflection on ethical issues, the evolution of our economic and financial systems, and examines problems linked to environmental issues and the responsible use of earth’s resources. In the area of Peace, the Commission is charged with reflecting on the problems of war, disarmament, arms control and the arms trade, international security and violence in its various and changing issues (terrorism, extreme nationalism, etc..). The Pontifical Council has also fixed its attention on political systems and the commitment of Catholics in politics. It is responsible for promoting the World Day of Peace. Learn more about the Pontifical Council for Justice and Peace….